I worry sometimes that I don't have anything very interesting to say on this blog, and I am just inanely repeating myself. I hope I'm not boring anyone. 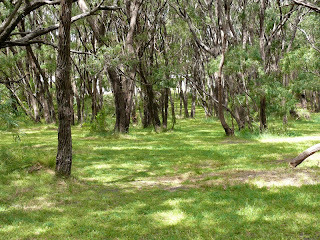 In saying that, as I couldn't think of anything to write about today, I took myself and my camera for a stroll around the property, clicking away, so come take a walk with me. 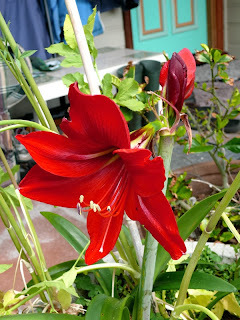 Beside the blueberry pot is this lovely hippeastrum flower, the very first one. At our embroidery group, we all bring in a small thing and pay 50 cents to be part of our weekly raffle, to raise money for our Xmas party. As your number gets called out, you go up to the table and choose something from the varied array that people have brought in. 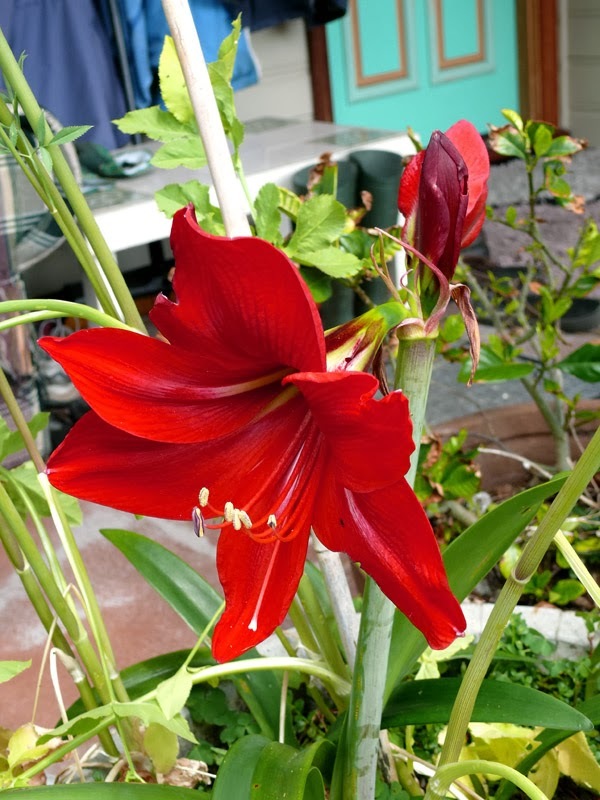 A while back I chose some hippeastrum bulbs that someone had dug from their garden. 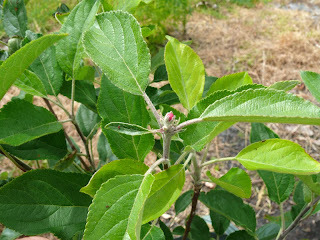 I was thrilled last week to see a big flower stem with three buds appear, and this is the first flower to bloom. 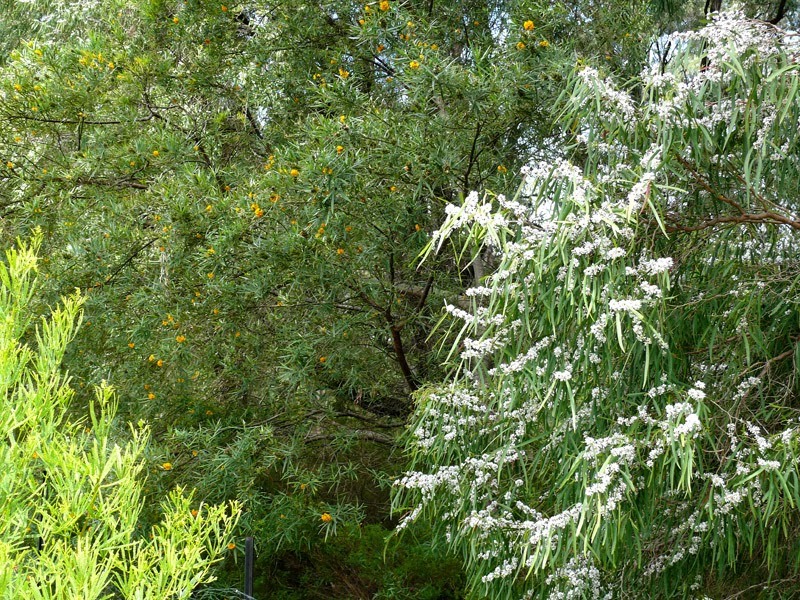 Next stop, at the north-east side of the house next to the driveway is an example of the beautiful white fluffy blossom on one of our jarrah trees. Isn't it pretty. To the side of our house and continuing down the northern border is a line of massive old marri (Corymbia calophylla) trees, following what looks to be an old, dry creek line. 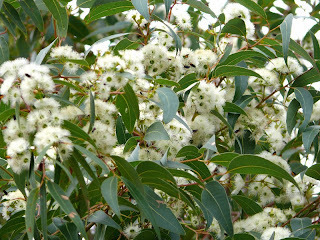 Marri (also known as red gums due to the dark red gum the bark exudes) are the gumnut trees and we often see the Whitetail and Redtail black parrots in the tops of these trees, munching on the seeds inside the gumnuts, then dropping the gumnuts to the ground. 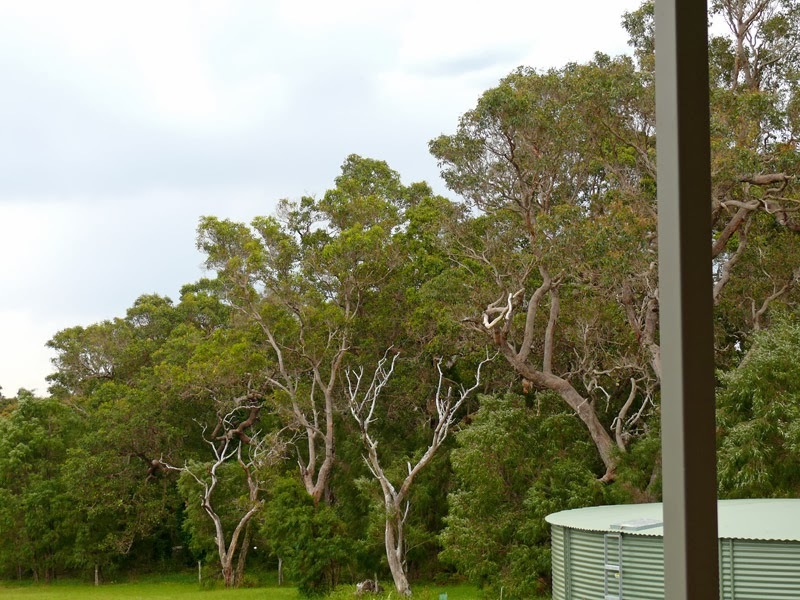 You wouldn't want to be standing under these trees when the gumnuts are raining down! Halfway down the hill I turn and look back at what we have accomplished here in a couple of years. To think if you had looked at this hill before that you would see nothing at all. I mentioned last post about how it has suddenly dried out, this grass (and weeds) was bright green a couple of weeks ago, things change fast. At the bottom of the hill we stop at the lower end of the creek, a winter creek that normally flows from about May to October. 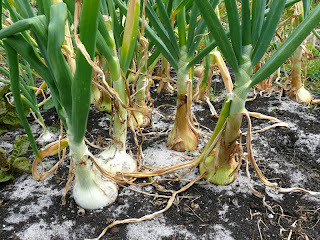 It was minutely trickling a couple of days ago but it looks like it has officially ceased for the summer. Whilst at the bottom of the hill let's go over to the big peppermint tree in the corner. 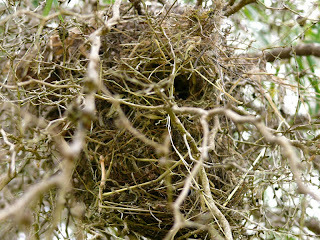 This is most amazingly intricate and superbly constructed nest. It's a cone shaped structure of twigs and various bits of detritus, with a tiny round hole about 2/3rds of the way down, with a tiny twig roof on a jaunty angle above the tiny opening. We spotted it a week ago and I'm trying to work out which little bird it belongs to. Upon doing some research I am thinking it might belong to a Western Gerygone. 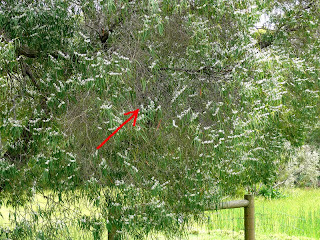 This is the tree the nest is in, with the red arrow pointing to it. So well camouflaged isn't it. 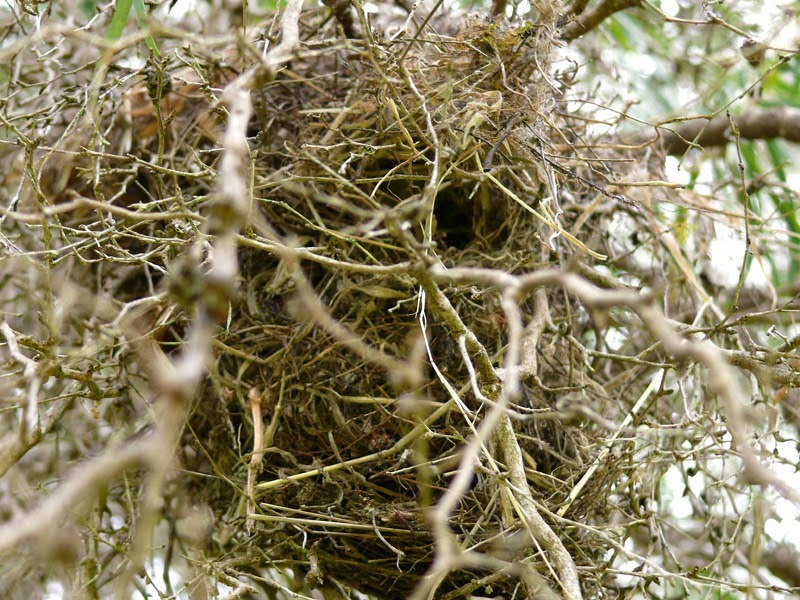 How does a bird know that the nest it is making will end up being a good one? They are clever little things. I start to follow the creek line up the hill, through our little peppermint (Agonis flexuosa) forest. 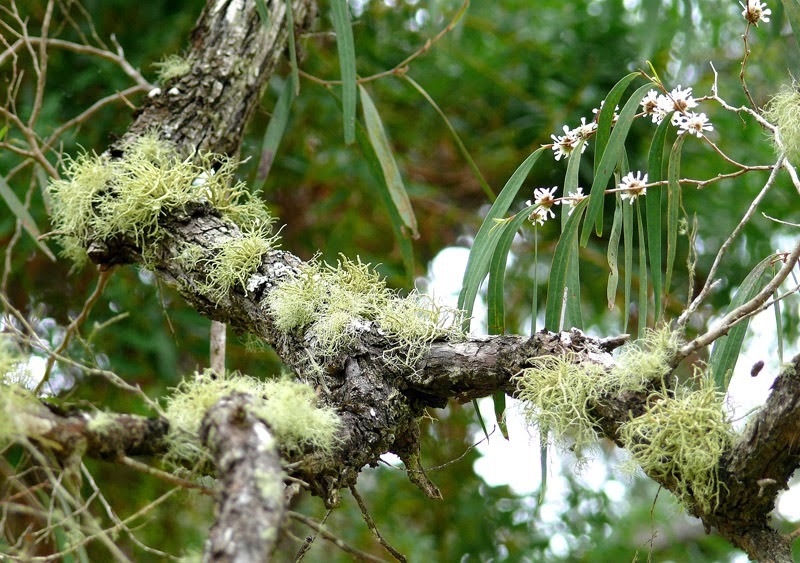 I stop at one of the ancient, gnarled old trees and admire the lichen that is growing on a branch above my head. 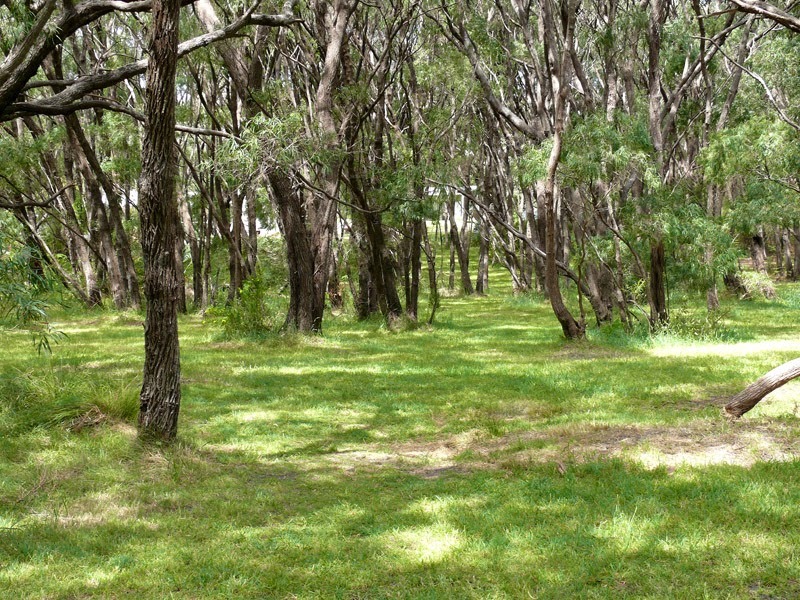 This is the lower part of the forest, just about all peppermint trees. 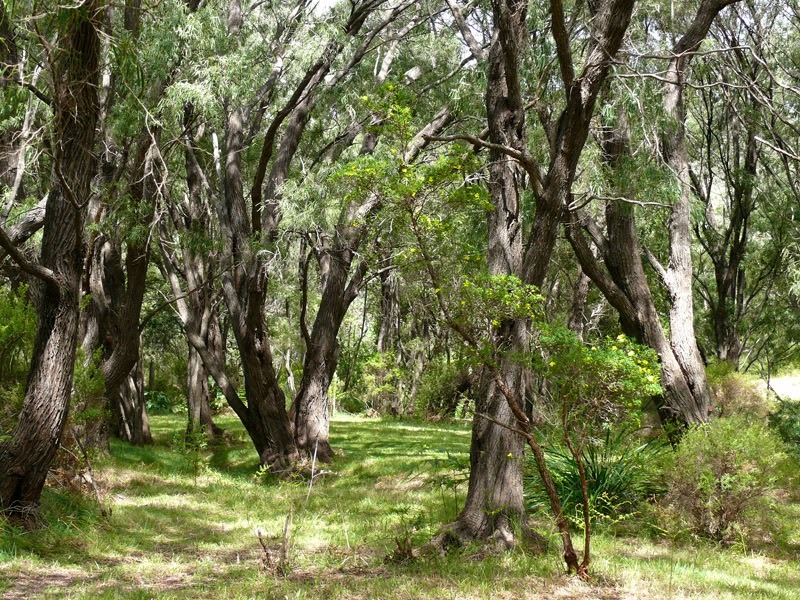 All very tall, some very big and tall, some very spindly and tall, all growing as tall as they can to get their share of sunlight. It is lovely and cool in here in summer, about ten degrees cooler than out in the sun. This is where we like to bring friends to play a game of boules. It is fun to fling the jack into various tricky spots. On the outskirts of this part of the forest is a big, old, fallen log and a pile of old bracken. 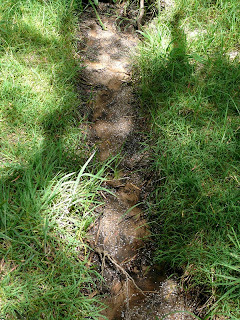 Steve thought he saw a tiger snake hiding under the log a few weeks ago, so we are cautious around this area. 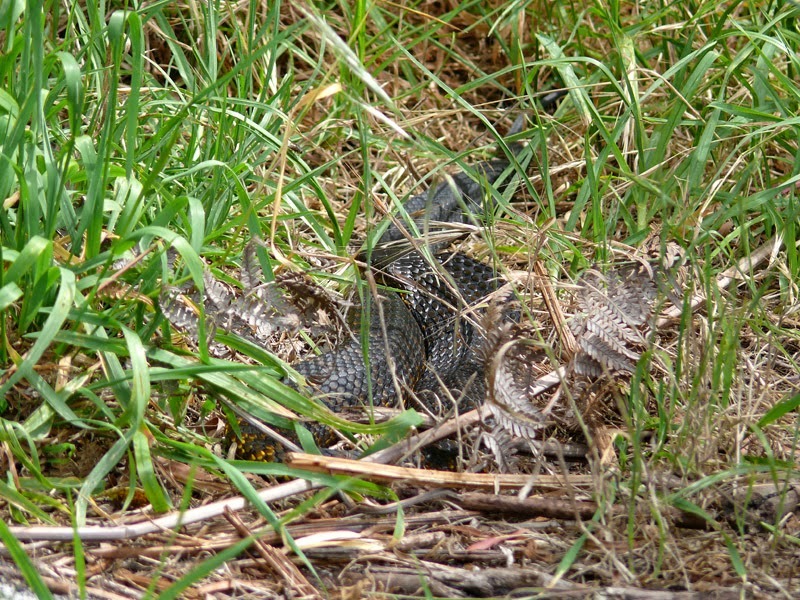 I walk past at a safe distance, and sure enough, a big fat tiger snake is sunning himself just in front of the log. 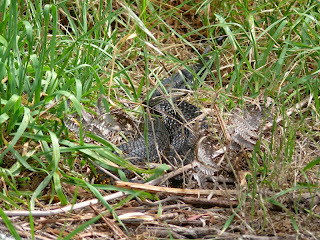 I have a very good zoom on my camera so I photograph him with plenty of metres between him and me. We are a long way from our house and outbuildings up the hill and I respect his right to be here. I carry on through the forest, following the creek bed up the hill. This is the corner of our place where our section of the creek comes from. 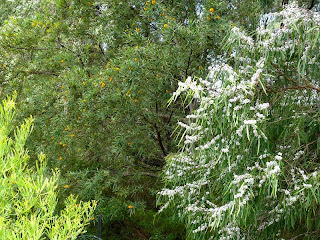 More beautiful big peppermint trees and the occasional jarrah here. 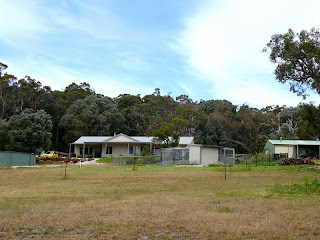 I follow the top boundary halfway along and then start downwards towards the shed. 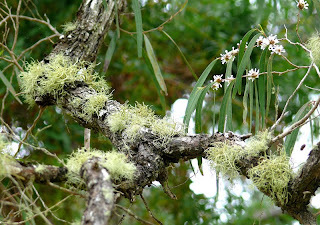 The outskirts of the forest here has more diversity. 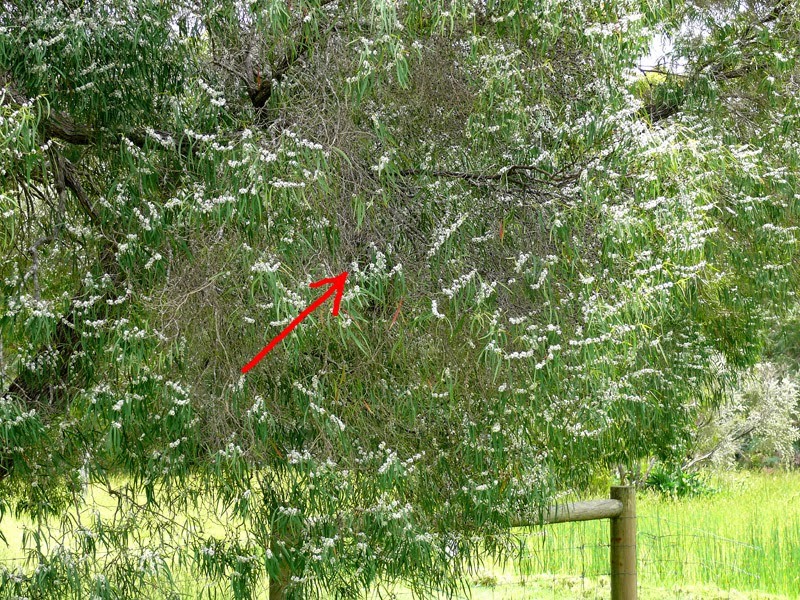 As well as peppermints, look at this one just dripping with lovely white flowers, there are jarrah and also these pretty native willows (Callistachys lanceolata). 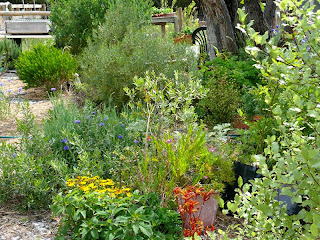 It's the one beside the peppermint with the yellow flowers. Tiny birds abound in this area. Here's a closeup of the native willow flowers. Such a pretty yellow colour. Continuing downhill again, past the shed, we arrive at the vegie growing area. This is the new section we fenced off this year to give us more space. 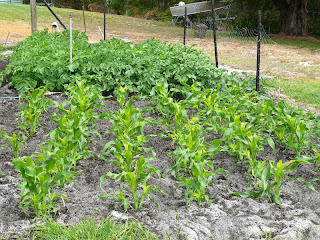 The potatoes and sweetcorn are growing well. In the corner of the main vegie patch, the rhubarb has sprung back to life with a vengeance, talk has been had to try and find the old old recipe for rhubarb champagne. 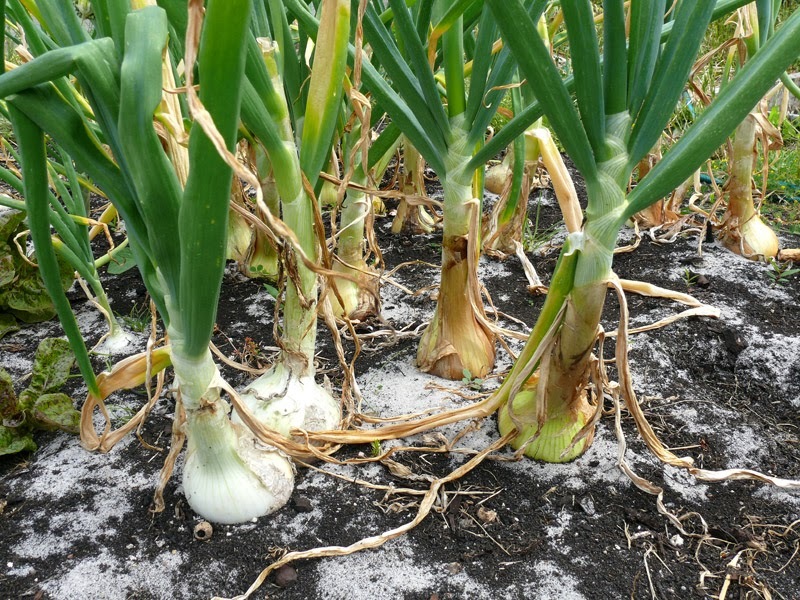 We must stop and admire Steve's gigantor onions. 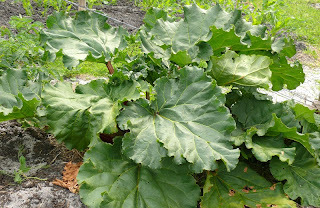 They are massive, as they also were last year, and extremely juice and delicious. We've just started using them. 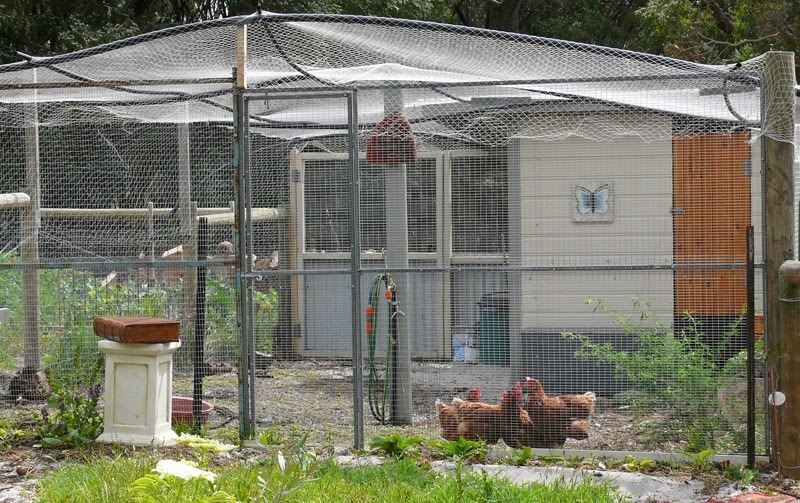 Moving now into my fenced garden, we say hello to the hens who always curious and become a captive audience whenever people are nearby. 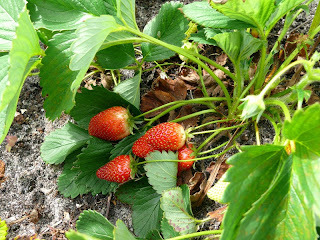 The strawberries are ripening at a rate of knots with the warmer weather. Rarely do they make it back to the house, nothing is nicer than standing in the garden eating strawberries warm from the sun. Like the blueberries, there is usually about half a dozen ripe ones every day. The chooks are rather fond of the strawberry tops. 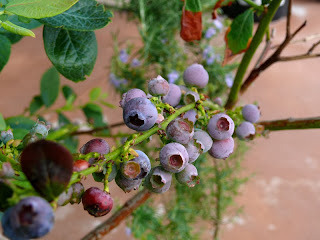 I nibble all the luscious red part then toss the tops through the netting above their yard. Fastest chicken on two legs is the victor. This is the most exciting thing happening at the moment. As we have yet to build our orchard fence, the few fruit trees we have are in pots in my fenced garden, to keep them safe from roos and rabbits. 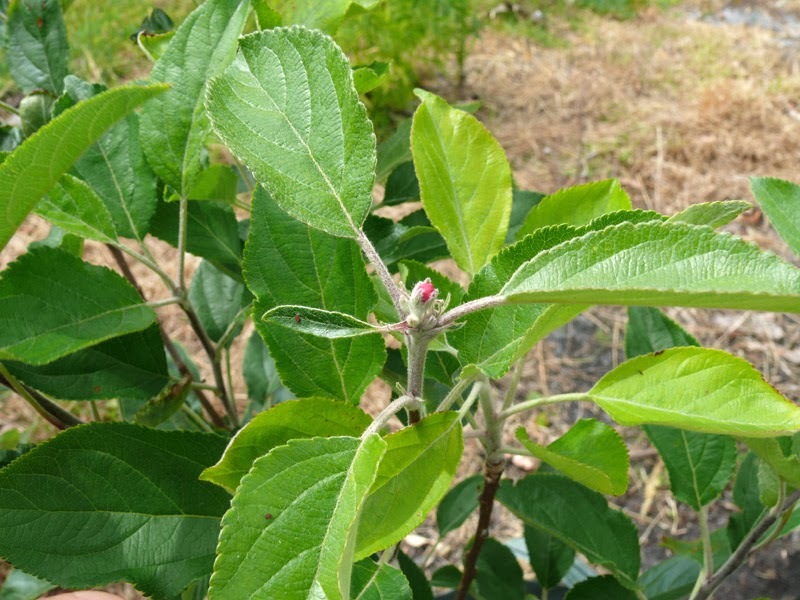 This little tree is one we have nursed since a tiny stick, it is a Bramley apple, an old English variety, reputedly one of the best cooking apples ever. Look! It has teeny tiny apples on it! These are the biggest two, about the size of a cherry, and I have seen perhaps half a dozen smaller ones on other branches, and it is still flowering. And this is the other exciting thing. 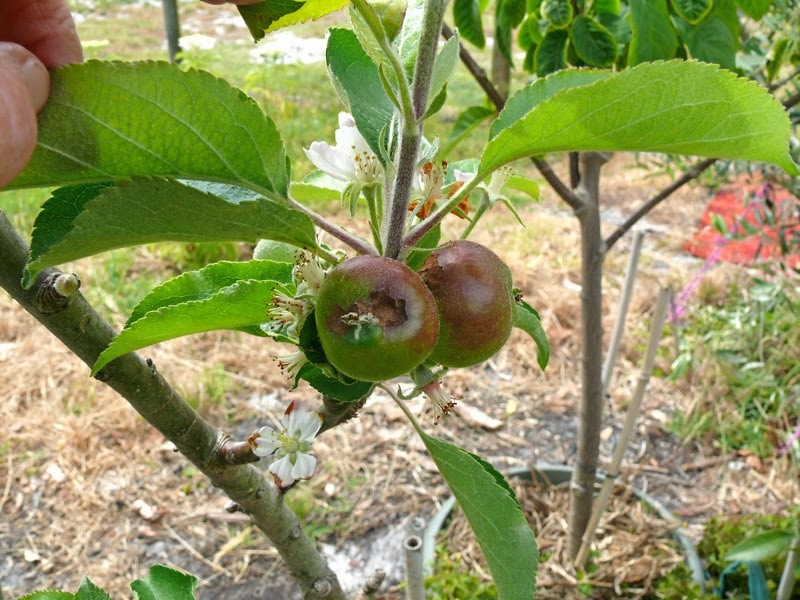 This even smaller tree is a Cox's Orange Pippin, another old English variety, reputedly a brilliant eating apple. Steve was quite delirious with joy when we found a nursery down here that stocked the tree. It has put on loads of leaf growth which is great, but yesterday I noticed this, see that tiny pink thing at the top of the branch? 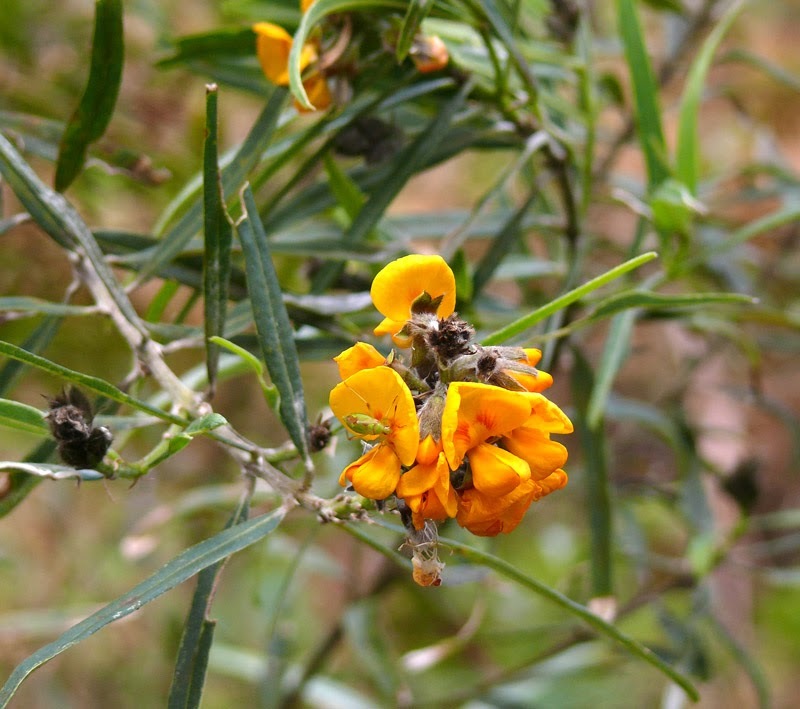 It's a flower bud!! Even if we only get one apple we will be happy, it would be a major achievement for a tiny tiny apple tree. 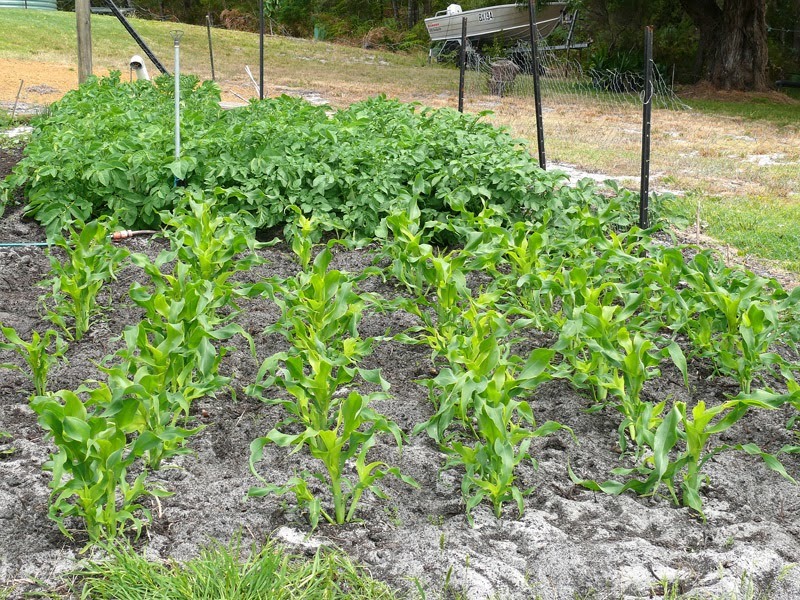 This is the remnants of my seed raising bed experiment I planted a month or so ago. It hasn't been very successful so I will do something different next time. I don't think my choice of growing medium was the right one, I used a combination of coir and food scraps compost, and all that really happened was that the millions of tomato seeds in the compost germinated and not much else. 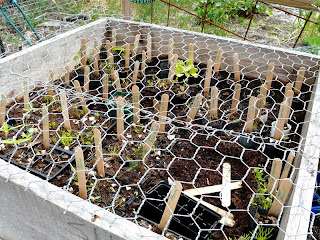 I managed to get some lettuce and cabbage seedlings and one zucchini into the ground from here, but a lot of things just haven't come up. Next time I think will invest in proper seed raising mixture, but I think I will still put the seedling trays inside the box for protection. My fenced garden is looking quite pretty at the moment, it looks fuller than it actually is as I put in annuals for some temporary colour and there are still a lot of things in pots that are grouped together, waiting for me to plant them. The kangaroo paw cuttings are continuing to grow and flower which I am thrilled about. The orange hybrid proves to be the abundant successful cutting from our Perth garden, but I am happy to see one of the yellows and one of the reds are also appearing. Excellent. 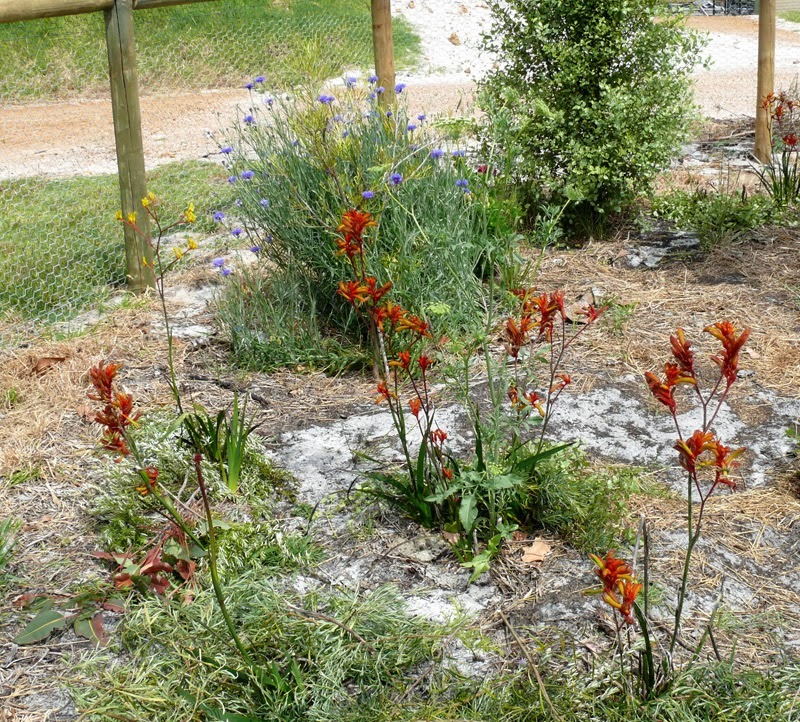 Once kangaroo paws take hold they are a beautiful display. I did enjoy the walk - and your blog is always interesting. I look forward to updates. You really are living the good life. Lovely to see it so advanced now! Never boring. I love seeing what is happening around the place. Awww... that was lovely Dy, not only lovely very inspiring :-) thanks for sharing!